A variety that is widely grown in Japan, from whence it originated. 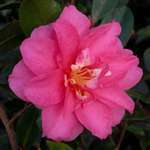 The deep pink, scented, medium-sized, double flowers appear in November and December. The plant is slow growing with a dense, spreading habit that is well-suited to containers or the smaller garden. Prefers a sunny, sheltered position. Lovely plant covered in buds. Looking forward to it flowering and smelling the scent. Bought as one of three plants, this Shishigara looks beautiful - see the review of the C. Vernalis Yuletide. AS ABOVE, BUT ALREADY SHOWING A RED BUD.